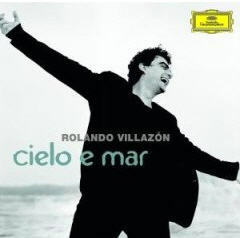 Rolando Villazon’s new recital disc Cielo e Mar, his first for DGG, was recorded in March of last year before the tenor’s cancellation of five month’s of engagements. The cause of Villazon’s disappearance was attributed to exhaustion. He has returned this year with a less intensive schedule than the manic pace he had moved at the preceding few years. There’s no sign of the collapse that was to occur shortly after this recording was made. The Mexican tenor sounds in fine voice which makes his subsequent vocal problems all the more poignant. Reviews of his 2008 performances suggest that his voice is still beautiful, but that it tires easily and that his high notes sometimes crack. Voices are as evanescent as shadows; often when they go they go for good or never get back to their previous best. Consider Ben Heppner who started to crack during his Otello run in Chicago in 2001. I was there and it was painful to see a great artist in so much trouble. He took time off and and has returned, but he’s not the same singer he was before encountering Iago. What will happen to the much younger Villazon is uncertain. All of the arias on the new disc are from roles the tenor has yet to sing. There is no reason that given luck, discipline, and hard work that he shouldn’t eventually sing a spinto role like Adorno in Boccanegra. After all it is these three characteristics that have enabled Placido Domingo to build an amazing career full of roles he shouldn’t have sung. But Domingo seems to made of extraterrestrial protoplasm. 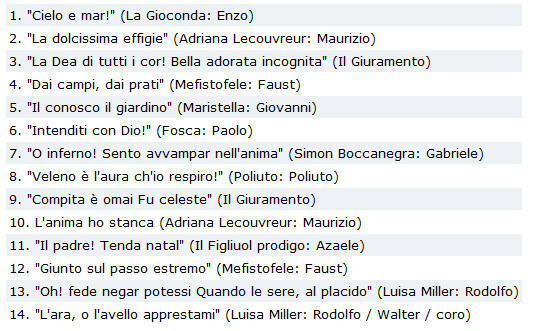 In addition to more or less standard stuff there are five selections that are rarely heard and which Villazon makes a good case for hearing more often. The two arias from Saverio Mercadante’s Il Giuramento sound beautiful when you hear them though they don’t seem to stick in your brain after they’re over. They’re six bands apart on the disc for no apparent reason. The same is true of “Intenditi con Dio” from Fosca by the Brazilian composer Carlos Gomes. The Gomes piece is quite beautifully sung. Villazon easily makes you interested in hearing more by both composers. But the main reason to buy a recital CD by a singer his to hear his voice and see how he realizes his interpretations. Villazon is first rate on both counts. His beautiful ‘creamy’ voice shows no sign of strain. He sings with feeling and conviction and phrases with sensitivity and finesse. His high notes are easily produced and have ping. If you’ve liked his previous work you’ll want to have this disc. I can only hope that this is not farewell recital. A voice this rare would be tragic to lose so prematurely. The conductor of all the selections is Danielle Callegari leading the Orchestra Sinfonica Di Milano Giuseppe Verdi. The full program is listed below. His voice is beautiful, as you probably agree, but his technique needs to improve. He should also try Mozart and Rosini for a while, and then come back with a bigger repertory.